Five gentlemen from around the globe have gathered to enjoy and indulge in what they love; and that is faithfully recreating the sound and styles of the popular classic hits, and mixing that with the best contemporary music.The award winning ensemble features Gary Philpott in a role he was born to play. With an unrivalled singing voice, he struts his stuff as the lead singer. Scott Shelley, Lee Carroll, Mario Merlini and Jon Callander support and complement Gary'’s uncanny exuberance with a musical feast of grooves, licks, and driving rhythms that make the band’s music so undeniably dynamic. 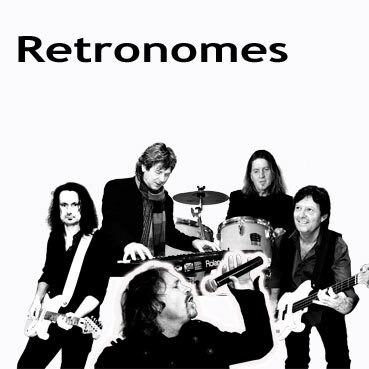 With their reperatoire of hit songs and elements from all of their successful tribute shows, the Retronomes can musically cater for any event large or small - the Retronomes can rock your socks off, or slip into the background as the situation requires.